The purpose of this study is to comprehend the physical circumstance and mental or emotional state of tourists sightseeing experiences by applying Experience Sampling Method (ESM) and establishing the variation and difference of the type of tourists` flow in the same time and place. The aim is to additionally explore the physical and emotional differences in experiences and to make tourists and boost tourist satisfaction. Subjects are 90 tourists sightseeing during a similar and brief time period (a 3 day period) from July 28 to August 10, 2010. Data were collected through ESF and questionnaires at a site location on Jeju island. From this, the findings are as follows. First, through suggesting researching method of identifying tourists` various experience and feelings, it is tried to expand the field of sightseeing research. Second, the researcher discovered state and change of the various flow`s form and self-efficacy according to the flow`s type and tourism experience and provided information to theorize. Third, the researcher suggested undertone provided in attraction site by comprehending tourists` various and complex tourism experiences. Self-image congruity has been proposed as a pivotal concept to understand a wide range of consumer behaviors. In tourism literature, however, there has been lack of research efforts to explore the effects of self-image congruity on festival experiences. This study examines the extent to which festival visitors` self-image congruity affects the satisfaction with festival experiences. This study also identify that festival visitors` involvement affect the degree of self-image congruity with the jazz festival. The on-site survey was conducted to examine the proposed hypotheses with Jarasum International Jazz Festival visitors. The results of the hypothesis confirmed the effects of involvement on self-image congruity, and further confirmed that the degree of self-image congruity positively affects festival satisfaction. However, it should be noted that the results validated the proposed hypotheses particularly when direct measurement items were employed. Theoretical implications are related to the issue of measurement scale and antecedents of self-image congruity particularly within the context of tourism. Directions for future research were also suggested in this study. This study attempted to develop a scale to measure the emotion related to the tourism product consumption by a systematic procedure. The scale development was proceeded through four stages. Initially, 125 emotional descriptors were collected by the unstructured survey method. At the second stage, those unfamiliar to consumers being excluded, 49 descriptors remained for further analyses. At the third stage, factor analysis and multidimensional scaling were used to identify the dimensional structure of emotion. The results showed the existence of eight positive dimensions and five negative elements. At the fourth stage, the scale was assessed for its reliability and explanatory power. Our TCES (Tourism Product Consumption Emotion Scale) showed the high levels of reliability. In addition, TCES provided a rich description in explaining the relationship between the cognitive evaluation of tourism product and the tourist`s emotional response. It was concluded that TCES can be utilized for the further progress of theories related to tourism consumption behaviors, and provide useful practical implications in this area. 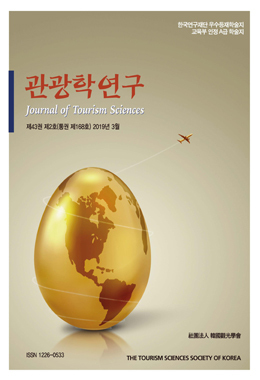 This paper empirically investigates determinants of inbound tourism demand for Korea using a dynamic panel data model. The empirical analysis uses the panel data set for the 34 countries over the period 1995-2009, estimating the dynamic panel model by the Generalized Method of Moment to control for the endogeneity of the lagged dependent variable. The endogeneity bias could be caused by the OLS estimation of the model which includes the lagged dependent variable as a regressor. Empirical results are as follows. First, the estimated coefficients of the lagged dependent variable are found to be statistically significant, which may reflect a high degree of consumer loyalty or an important effect of ``word of mouth`` in determining international tourism demand for Korea. Second, empirical results show that the estimated coefficient of income elasticity of tourism demand to Korea should be positively significant, supporting the results of the previous studies. Third, the cost of tourism to Korea turns out to be statistically significant and thus an important factor in determining tourism demand. Finally, In contrast to theory prediction that foreign exchange rate can have positive effects on tourism demand, however, there is no robust evidence that nominal exchange rate should lead to an increase in tourism demand. Compared to mass tourists and individual tourists, medical tourists are likely to stay longer and pay more at tourist destinations. Due to their different behavioral patterns and sizable economic impact, a number of Asian countries are eager to attract more medical tourists to date. This study aims to examine distinctive influences of several variables on medical tourists` demand for visiting Korea. In particular, this paper intends to investigate different roles of the two features of medical services and travel services comprising the concept of medical tourism. In order to specify the medical tourists` demand, this study makes use of count data models such as zero-truncated Poisson and zero-truncated negative binomial models. Study results suggest that medical tourists are more likely to visit Korea as they indicate higher importance on the aspects of medical services. This study fails to identify statistically significant associations between the two dimensions of travel services and the number of visitors to Korea for medical tourism. Based on study results, this study presents several management implications that help the two key players in medical tourism develop diverse efficient strategies. This study aims to analyze tourism policy orientations and its determinants through investigating tourism spending patterns of local governments. Tourism budget collected from a total of 82 local governments, which actively expressed tourism is a means of revitalization of their regional economy, and political system and three environmental -attribute variables with regards to the policy determinants theory were used as the dependent and independent variables respectively. Despite the budge spending patterns were clearly classified into expansion and reduction orientation, each of them was politically difficult to be accepted. It was revealed that the determinants by each orientation were not so much both political-attribute and policymakers` actor-attribute variables as they were socioeconomic one, such as tourism demand, financial ability and tourism policies related central and their upper governments. These results suggested that the policy is not preferred by local politicians and furthermore, has been occupied as an inconsiderable function relatively and a lower status among policy areas in the local governments. This research was conducted for the purpose of exploring determinants affecting the perception of new environmental paradigm (NEP) and revealing its marketing implementations. Results from analysis are as follows. First, 3 factors (humans over nature, balance of nature, limits to growth) were delineated among 12 NEP scales, and 3 factors (contents, media, method) among interpretation program through factor analyses. By utilizing factor analysis there were derived 3 factors (functional value, overall value, emotional value) among perceived value, and 2 factors (satisfaction of visit, satisfaction of interpretation) among satisfaction variables. To understand the level of environmental perception, this study used sum of NEP scales and by utilizing K-means cluster analysis, total samples were divided into 3 groups (high NEP group [n=122, 52≤NEP], medium NEP group [n=244, 44≤NEP≤ 51], low NEP group [n=74, NEP≤43]). Third, the determinant variables having influence on each segment cluster were derived such as visitors` characteristics (age, income and length of time), interpretation program (contents), perceived value (functional value), satisfaction (satisfaction of interpretation). This paper was to investigate effects of shopping quality and shopping risk on future behavioral intention (satisfaction, repurchase behavioral intention, recommendation) in shopping tourism, based on theories of consumer behavior. Data were collected from tourists who visited shopping centers in special tourist zones designated by ministry of culture, sports and tourism. Total 1,759 questionnaires were analysed. Results of the study are as follow. Firstly, it was found that shop quality and accessibility were variables influencing on satisfaction, and accessibility was a variable on repurchase behavior. Salesperson factor and product factor had significant positive effects on satisfaction, repurchase behavior, and recommendation intention. Secondly, psychological/ performance factors of shopping risk decreased satisfaction, repurchase behavior, and recommendation intention. Thirdly, satisfaction had positive effects on repurchase behavior and recommendation intention. Fourthly, it was analyzed that satisfaction had mediated effects while shopping quality influencing on repurchase behavior and recommendation intention. The findings were discussed in the context of invigoration of shopping tourism.